Lesson 14: The Question of "When?" In the previous lesson, I have sufficiently covered time expressions in Burmese. But, you still need to know how to put those words in the form of questions or answers. Burmese question word "when" can be either in the past tense or the future tense. The question of "when" in the past can be a bit more tricky than "when" in the future, so we will spend more time discussing about it. But, first we will start with "when" in the future, which is simple, and yet quite useful. beare2-dau1 la2 ma1 leare3 -- When will you (or someone) come ? beare2-dau1 xxxx ma1 leare3, where you substitute xxxx with the verb of your choice. 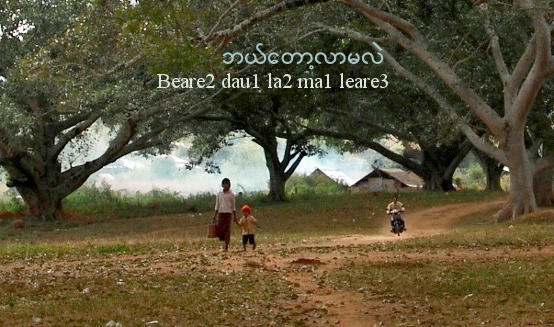 beare2-dau1 yah1 ma1 leare3 -- When will it be ready ? beare2-dau1 yout ma1 leare3 -- When will they arrive (or) When will we reach there? beare2-dau1 thwa3 ma1 leare3 -- When will you go ? You can further clarify your question by adding the subject in front of beare2-dau1. The Burmese phrase beare2-dome3-gah1 leare3 is a loose term that covers a wide range of possible questions based on the context of the conversation: "When was that? ", "When did it happen? ", "When did you do it? ", "When did she come? ", and so on. First Person: I've already bought it. Second Person: beare2-dome3-gah1 leare3 -- When was that? When did you buy it? We have already seen the word beare2 before. It is used in the question "where" and "how". Both the words dome3 and gah1 indicate the time of action, the time something happened, or the time of existence in the past, and in combination with beare2, it forms the question word "when" in the past tense. To be more precise, dome3 is equivalent to "while" in English. If you are the one to start the conversation, you need to be more specific in asking the question, "When did you buy this?" beare2-dome3-gah1 -- when was that? da2 beare2-dome3-gah1 weare2 ta2 leare3 -- When did you buy this? xxxx is the pronoun such as "it", "that", "he", "they" or noun such as plane, train, name of someone. yyyy is the action word (verb) such as "buy", "sell", "come", "go", "do"
Please refer to lesson 7 for a longer list of verbs. thwa3 -- means "go"; it is used as a particle in Myanmar grammar (comparable to auxiliary verb in English) to show the change of state to mean "come and go", "take and go", "return", "do and go", etc.. It changes the sentence into past tense. hta3 -- means "put"; it is a particle where the result of the action on the object in the past still can be seen such as, "bought and put something somewhere", "made and put something somewhere". nay2 -- an action is still ongoing; unchanged state. Unlike the hta3, it refers to people, not passive objects. pfu3 -- particle to mean, "have done before", "have been before", or "have gone through before" in the past. zzzz is optional when the situation doesn't fall into the above categories. ja1 -- modifies the verb "yout" to plural to indicate more than one person. ta2 -- points to "they" who arrived and still here. ma1-net ga1-deare3-gah1 yout nay2 ja1 ta2 ba2 -- They have been here since this morning. Let's revisit the phrase, "When did you buy this?" mentioned above. If the object is still there and can be seen, you can substitute hta3 in place of zzzz. As we have seen in lesson 4, there are many ways to say "you" in Burmese. Here's one. kha1-mya3 beare2-dome3-gah1 yout pfu3 ta2 leare3 -- When was it that you have been there? When have you visited the place before? Time is very fascinating. I am in my present time as I am typing this. I can imagine that there will be you in the future who will be reading it. beare2-dau1 leare3. I can't say when. But, by the time you are reading this, I at this moment will be well in the past. beare2-dome3-gah1 leare3. We will just have to search for the answers somewhere in time.